Heard of Vice golf balls? Meet the makers and watch what goes in to the production of creating a Vice golf ball. About Vice: The young German golf ball start- up was founded in 2012 on the belief that premium-quality golf balls should be more affordable for golfers. Vice Golf has created a lot of buzz in the golf ball market already and was awarded multiple times from well-known sources that prove their quality. 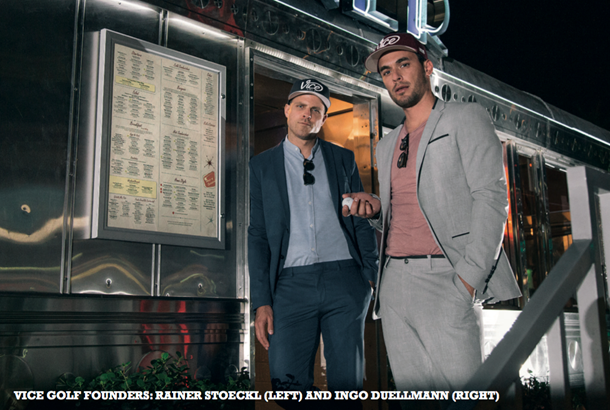 We had the opportunity to meet the faces behind Vice Golf – Ingo Duellmann and Rainer Stoeckl, both studied lawyers and consultants – and we recently took the chance to ask them a few questions. Read our interview then watch the video below on the process of producing Vice golf balls! What was the reason for you to start a golf ball company? Duellmann: Honestly, we were annoyed by the fact that we couldn't be more creative in our jobs and wanted to be our own boss in our daily jobs. We came across golf balls by chance and saw the huge margins that were passed on along the value chain – the golfer being the person to pay for all this did not sound fair to us so we started to research the golf ball market and realized that very little had changed for decades and that there was no alternative to all the established brands! We sat down with aerospace experts, chemists and physicians and started to develop a golf ball that could hold up with the big names in the market. It took countless night shi s and numerous iterations, stupid mistakes included, to come up with a golf ball that we were comfortable with presenting to the demanding golfers in the market. That must have been an exciting journey! What separates your brand from the well-known, established brands in the market? Duellmann: In short, we offer a high-quality range of performance golf balls from basic to premium golf balls at affordable prices with strong emphasis on design and style. Within two to five business days, we ship our products straight to our customers doorstops and on top of that, we offer customization like corporate logos, text slogans or images on our golf balls starting from one dozen which is quite unique! Besides that, we have our golf balls tested by independent testing labs regularly to make sure that performance remains outstanding. What is special about the UK market? Stoeckl: It is the home of golf with memorable golf courses and a lot of history, Golfers om the UK value the tradition of the game and are very honest people. Many of the golfers in the UK trust Vice Golf already and we see a strong word-of- mouth growth om golf societies all over the country. Will we see Vice golf balls being teed up at major tournaments soon? Duellmann: Our philosophy is to support young up and coming players instead of spending millions of pounds for PGA Tour players. We are really proud to support the Italian top amateur Luca Cianchetti who will be teeing up with a Vice Pro Plus ball and well dressed with a Vice cap and a Vice PURE glove. He is one of the best amateurs, among his victories is last year's International Amateur Championship! TG: Speaking about other Vice products - what do golfers find on vicegolf.com besides golf balls? Stoeckl: Golf balls are our core competence but of course, there is more to the game of golf than just golf balls. Our portfolio is constantly increasing and it includes a 100% waterproof carry-bag, pure lamb leather gloves, microfiber towels, headcovers, stylish snapback caps, and occasionally limited edition caps, which sell very quickly! We have the same mission for all of our products: Outstanding quality paired with a cool design at affordable prices. TG: Give us an outlook - what will the next product be? Duellmann: There will be a few releases but we don't want to reveal too much – for sure, UK golfers should keep their eyes open on our social media channels and check out www.vicegolf.com!